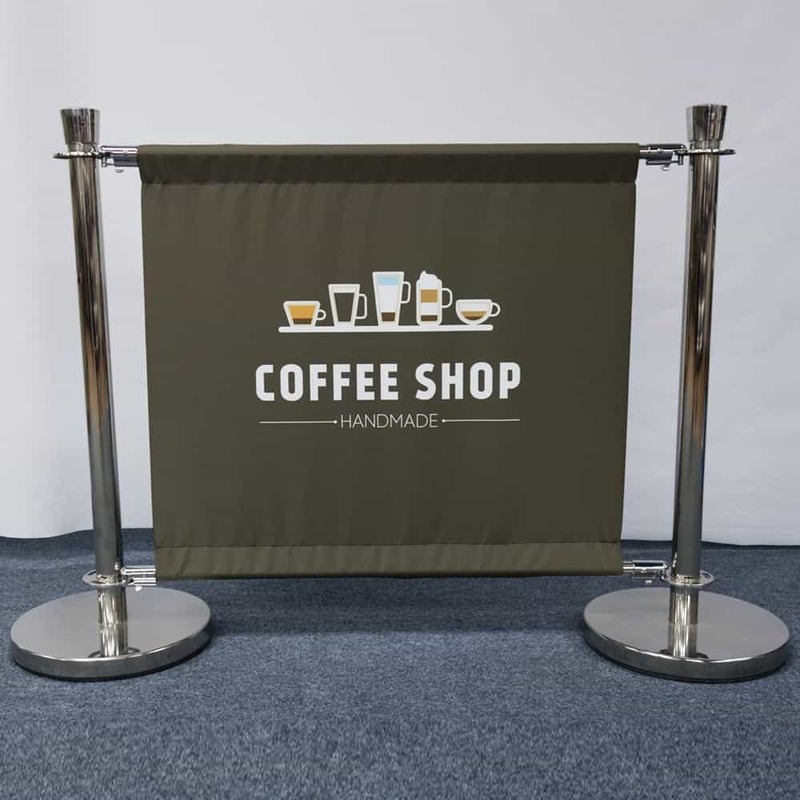 Custom printed cafe barriers or cafe banners are a great high-quality addition to outdoor cafe and restaurant seating areas. They are DDA compliant (see ‘More Info’) and available in a range of sizes, materials and branding options. Also perfect for outdoor and indoor events, roadshows, product launches and exhibitions, they offer a practical method of showing off your brand, creating area dividers and are quick and easy to configure. 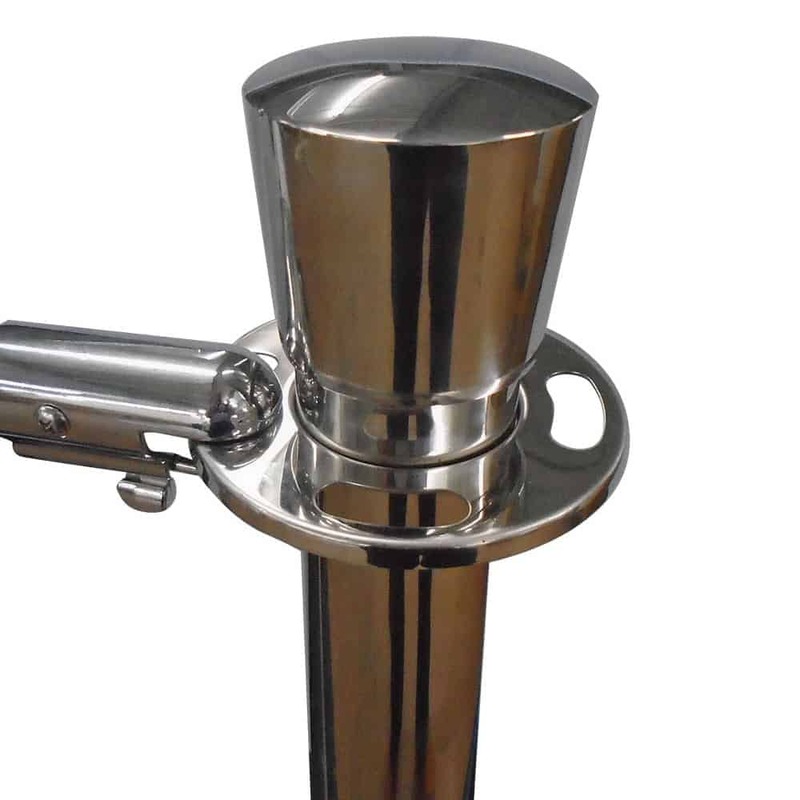 Made from heavy-weight stainless steel, we have a variety of size and material options, printed single and double-sided. Below is an example of how to decide how many components you may require. 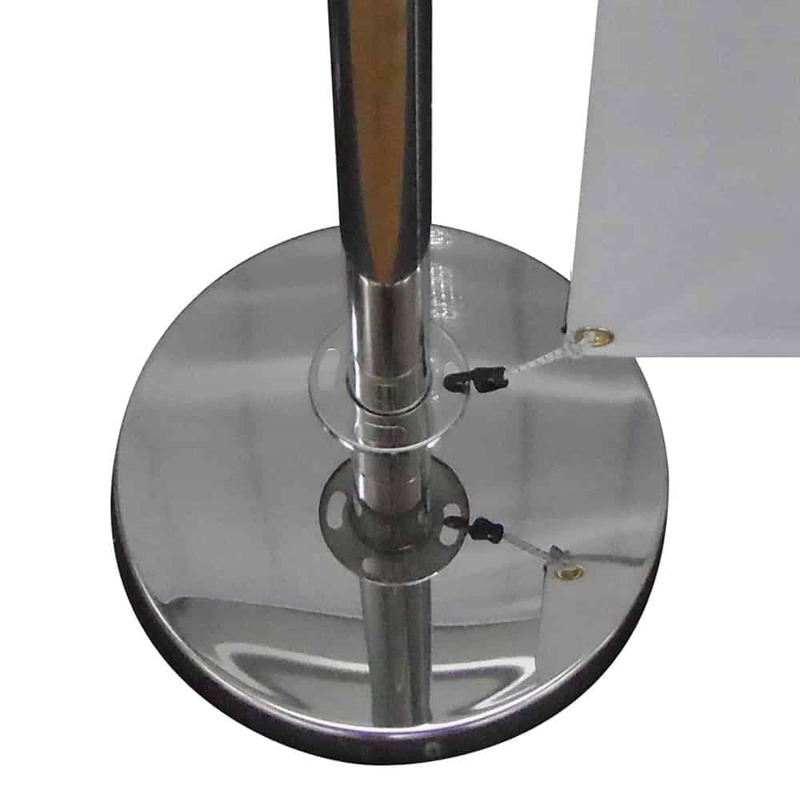 For example, for two stand alone cafe barrier systems you will need 4 posts and 4 bases. For two joined cafe barrier systems, you will only need 3 posts and 3 bases. All barrier skins are digitally printed full colour, therefore there is no restriction on logo or branding size, as the entire face can be printed. For double-sided skins, your choice of materials enables you to select the best one for your particular requirements. Hover over your selected material below to see a how the cafe barrier would look from the reverse. A hard wearing weatherproof textile with black back for zero show-through. Our PVC banner is wipe clean and perfect for use indoor or outdoor. PVC Mesh material allows wind to pass through the reducing wind resistance. Our PVC banners is wipe clean and perfect for us indoor or outdoor. PVC Mesh material allows wind to pass through the mesh reducing wind resistance. 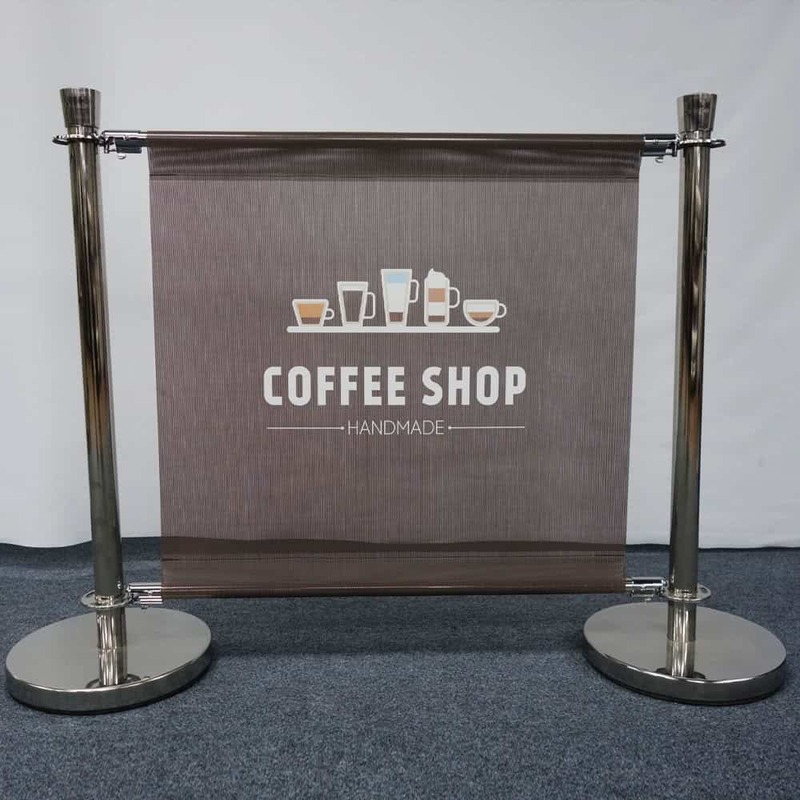 When used with both top and bottom crossbars, our cafe barriers and screens are DDA compliant (Disability and the Equality Act 2010), the bottom rail allowing audible tap and resistance for the visually impaired. The system uses a fixed disc at the bottom to ensure the banner hangs in the correct position and acts as an anchor for the bottom rail without compromising the look and finish of the banner. 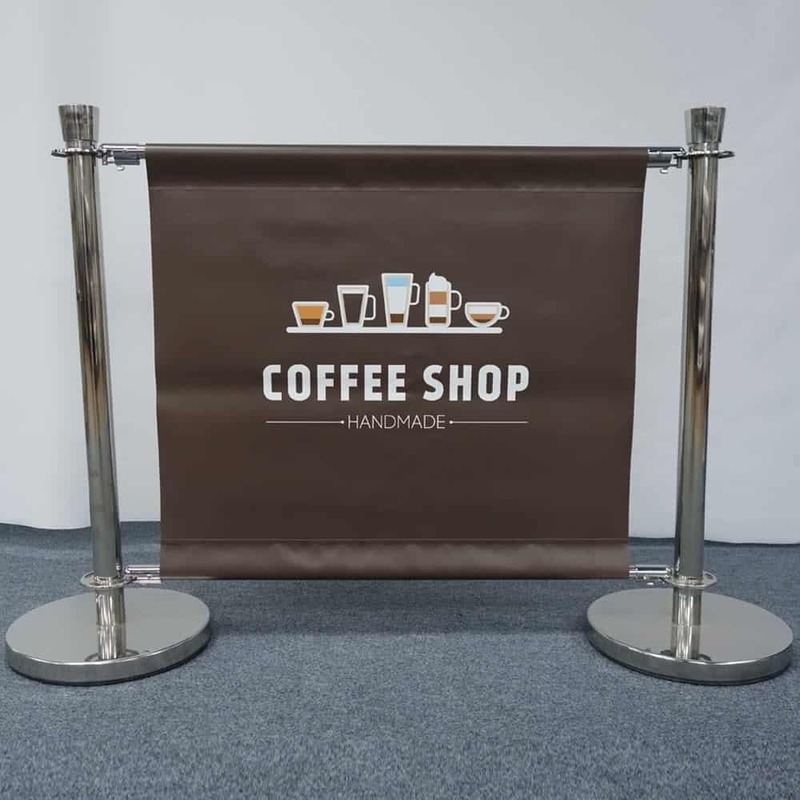 For events, the most cost-effective way of using cafe barriers is to only order the top bar and fix the banner with bungees attached to the fixed disks at the bottom. This method is not recommended where there is heavy traffic, in pavement cafes or restaurant seating areas, as these usually have to comply with the DDA regulations.